Want something with Dab radio that doesn't look like it came out of the ark? Want DAB as part of a system with CD player? Want 'stereo' that sounds great? And all at an unbelievable price? That's what we found in the Goodmans Micro 1104SDAB. We weren't particularly looking for all those features, what we wanted were a couple of good quality, non-portable stereos that we could give the girls for Christmas. Non-portable, because we didn't want another one they'd cart around and break. Wandering round John-Lewis we found a stack of these Goodmans micro-systems. I've had a couple of Goodmans products before and never been disappointed and at the special price of £69 I was wondering what the catch was. 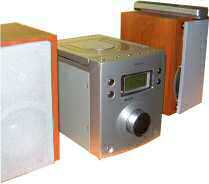 They looked pretty good, and at a price most manufactuers charge for an ugly 'retro', mono DAB radio they offered a sleek, stero unit including DAB/FM radio and CD player. The box included the stero unit itself with separate speaker units, users manual, remote control and power cord. The unit itself has an quality metalic finish and all the controls have a solid robust feel to them. The front-panel contains a number of controls, the most prominent being a large volume control and bright blue backlit LCD display panel, which is also a good size. The speakers are excellent quality with a wood finishes that manages to look modern. I'll come onto the quality of the sound in a moment. Finishing the set is a comprehensive remove control. Given the preponsity of remotes to get lost (particularly in childrens bedrooms!) I was very pleased to see the every function as far as I could tell is available from the unit itself. The CD player is of the top-loading variety, with a well dampenned hinged opening. Controls for the unit are spread over the top and front of the unit. I found these to be somewhat awkward in use, particularly for the DAB radio. To choose station you have to use the up/down buttons on the top of the unit, which scrolls the stations on the LCD panel. When you see the station you like you then have to push the station select on the front of the unit. Personally I'd prefer the select and scroll buttons to be next to each other, or even better a rotary tuning dial with a push to select that I've seen on other products. In operation the sound quality for this system is simply superb. Considering the size of the speakers the sound is rich and vibrant with a good base sound. I think the quality is actually better than another micro-system, admittedly brought a good few years ago, but that cost hundreds of pounds. If I want to look for minor faults then it would be the lack of a 'line-in' facility. I find such a feature very useful in the days of MP3 players. A small hard-disk unit plugged into the line-in connection is almost indispensible, but then I guess you can't have everything - at least not at this price! Given the price of this product and the superb quality I find it really difficult to find any meaningful quible. Those that I mention (control layout) really are insignificant. As I say, we got hold of these units in John Lewis a week before Christmas at the amazing price of £69. Less than many companies want to charge for a mono DAB radio. Unfortunately John Lewis don't seem to have any in our local store now and they aren't on their web-site. This seems to be available at our local Tescos now at about £69 (can't remember exactly - possibly has the 95p on the end). They seemed to have quite a good stock of them. Not on the Tesco web-site however.